The Unger HydroPower DI 06 Pure Water System is a DI pure water unit perfect for the professional window cleaner. It weighs 24lbs, and has no need for a power outlet, it runs on the pressure coming out of the tap. This DI system can produce up to 0.414 gallons of purified water per minute based on water hardness. The HydroPower DI 06 utilizes 1 QuickChange resin bags, Unger’s unique filtration system, for easy on the spot change. 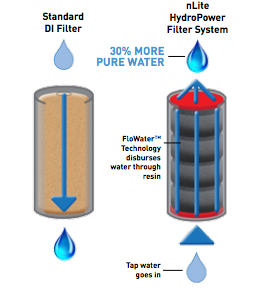 Unger’s FloWater Technology ensures more efficient flow of water through the entire vessel. This WFP System is easily transferred into and out of a work van by one person. It is best for frequent use cleaning 1-3 stories without needing a pump, or for areas with very low TDS. This machine really performs well with no spotty glass. this machine does a spot free cleaning do your research and you will find that Unger uses approximately 40% more resin than Filtered machines. How much did it cost the last time you paid for filters to find that you still had spotty glass? I would recommend metal fittings over the plastic ones that come with this machine. Get the cart you will not be disappointed It has a Digital TDS meter it has solid rubber tires that will not go flat, its built solid I attached a hose real on the back of the machine.it is not to heavy and can be removed from the cart so its portable & easy to change the resin bags. the price is reasonable for what you get Unger makes solid products. I will be buying another machine from Unger.